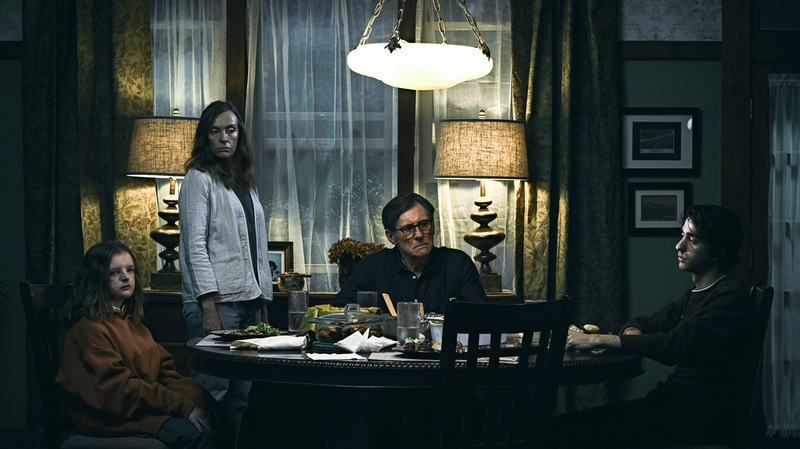 Director Ari Aster Says 'Hereditary' Is A Family Drama At Its Core Critics and audiences have called the film "traumatizing" and "terrifying," and Aster says that was his intention: to upset audiences deeply. But he wanted to focus on family drama before horror. Millie Shapiro, Toni Collette, Gabriel Byrne and Alex Wolff play the troubled family at the center of Hereditary. Hereditary has been called "emotionally devastating" and "disturbing" by critics and audiences alike. It's a supernatural horror film, with sinister things lurking just out of sight, but when writer-director Ari Aster was pitching his first feature-length film to studios, he says he was careful not to call it horror: "The film is a horror film, it's unabashedly one, but as I was pitching it, I was describing it as a family tragedy that curdles into a nightmare." The nightmare begins with the funeral of Joan, the Graham family matriarch, a formidable looking woman who peers at the audience from her portrait. Her daughter, Annie — played by Toni Collette — asks if she "should feel sad" about her mother's death, her grandson and husband seem indifferent — only Charlie, her granddaughter, (Millie Shapiro) seems to care. At first, the plot functions like a melodrama. There's clearly tension among the family members, in the way they avoid talking to each other or even really looking at each other. I wanted the film to function first as a vivid family drama before I even bothered attending to the horror elements. Annie isolates herself from her family, working long hours on highly detailed, lifelike dioramas depicting scenes from her own life. Peter, her teenage son, (Alex Wolff) is preoccupied with girls and smoking weed with his friends under the school bleachers. And Charlie is taciturn, more interested in making strange toys from odds and ends (and a pigeon's head) than she is in making friends with her classmates. Then, about 30 minutes in, something unspeakably awful happens — an event that Aster calls the film's "Janet Leigh stepping into the shower scene." "It's designed to be a left turn that changes the course of the rest of the movie," he says, "but I guess it's really also designed to operate more like a chute that opens up under the audience and kind of drops them into hell." The event throws the Graham family into hell too. Tensions that were already simmering under the surface begin to boil between Annie and Peter, Annie and her husband, Steve. "I wanted the film to function first as a vivid family drama before I even bothered attending to the horror elements," Aster says. "This family is ultimately eating itself out of grief, and I wanted to make a film that took suffering seriously." As Annie's grief leads her to spiral out of control, she meets a woman who introduces her to the world of the occult. The family's tragedy quickly devolves into a nightmarish hell of seances and demons, all part of a supernatural conspiracy that culminates in a screaming, almost ecstatically horrific finale. "They already had these minor dysfunctions, right? The tinder had been set, so when grief came for this family, they weren't equipped to deal with it," says Caetlin Benson-Allott, a professor of film and media studies at Georgetown University who teaches classes on horror films. "That's a theme that a lot of us, I think, can identify with ... When life isn't perfect, when you're out of control and when maybe the people who are supposed to be protecting you are the ones who are doing the damage." Hereditary stands out, she says, because it's barely more than a story about the horror of everyday life. Stripped of the supernatural and occult elements that dominate the third act, the film could almost function as a bleak portrait of a family collapsing under the weight of its grief and legacy. But for Aster, those elements were inherent to his story. "I found it allowed me to approach the story more expressionistically," he says. "Like, there is this dollhouse motif, running through the film." The camera frames the characters as though they're figures in one of Annie's lifelike dioramas, watching them with an almost omniscient eye. "It just struck me as a solid metaphor for the family's situation, which is that they're ultimately people without any agency. They are like dolls in a dollhouse, being manipulated by these outside forces." I always knew I was making a film that was potentially very alienating ... It is a film whose primary aim is to upset the audience on a deep level. Benson-Allott says, "You really see that dark side [of the dollhouse] in Hereditary, in the way it shows us that recreating life can be an exploration of the dark side." And Annie's dioramas are dark, and one gets the sense that they are, for her, a kind of therapy. Her mother lies in a hospice in one, her mother looms in a bedroom doorway in another, her mother stands over Annie as she breastfeeds her child. "It's absolutely a family melodrama, and family dramas are often horrifying," Benson-Allott says. "Horror is not the same thing as disgust or shock. But that's what American horror movies often hand us — those jump scares where something goes bang and the monster leaps out from behind a door. But horror is a profound recognition that things are not as they ought to be." So Hereditary twists relatable themes and familiar tropes into something deeply unsettling — and Ari Aster knows it. "I always knew I was making a film that was potentially very alienating," he says. "It is a film whose primary aim is to upset the audience on a deep level."